Japan are unlikely to win the World Cup but their fans are proving champions off the pitch in Russia with their exemplary behaviour, even cleaning up after themselves at matches. Their conduct is a healthy antidote to scenes of violence that have marred some major international football tournaments down the years, though this World Cup has been free so far of a disorder. 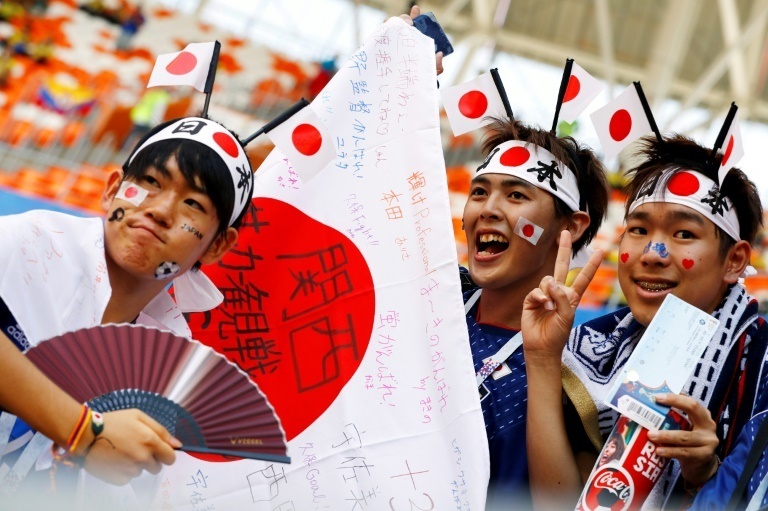 Footage of Japanese supporters tidying up after a game – cue amazed reaction from fans of other countries – has become a staple of recent World Cups. Following their shock 2-1 win over Colombia on Tuesday – the first time an Asian team had beaten a South American one at a World Cup – Japanese fans gathered up their rubbish and stuffed it inside blue plastic bin bags. The blue is no coincidence — it is the colour of the national side’s shirts. Their behaviour appeared to inspire Colombian and Senegalese fans to follow suit. This could be the tidiest World Cup in history. Such is the interest the Japanese fans’ behaviour has generated, a journalist from The Sun tabloid newspaper in Britain asked defender Maya Yoshida about it on the eve of Sunday’s clash with Senegal in Yekaterinburg. “Of course it is not just the national team who represent Japan, but the fans in Russia also, so to be praised by the whole world, we are very proud of this,” Yoshida said. It may be a surprise to many, but Japanese football fans cleaning up after themselves happens at league matches in the country too. It is repeated at other public areas in the Asian country, including cafes, cinemas and music concerts. Masaya Tsukada, in Russia to see his country play, said cleaning up after a game was an unofficial “fan rule”. So what would he do if a fan littered and did not bin it? “We won’t say anything because Japanese are shy,” said Tsukada with a laugh. And what about abusing opposing teams or players, or criticising their own side if they lose? Daiki Aoyanagi and Taiki Murai were weighing up having a beer at the Americana bar in central Yekaterinburg, a hub for World Cup fans in the city looking for a drink or five. Domestic Japanese teams do have so-called “ultras” and there are overtly right-wing football supporters, but Aoyanagi bristled at the notion of a Japanese hooligan. “No!” he said, raising his arms in a cross to emphasise the point. Yuma Fujita said that it is “traditional Japanese values to keep somewhere clean for the next person and appreciate the environment”. The 19-year-old, from the city of Niigata on Japan’s west coast, does not swear at football matches and said most do not because games in Japan attract a lot of women and children. But he would not mind seeing a bit more rude language, within reason. “It would help develop football culture in Japan and at some level it would be more exciting,” he said.